Out to Frimley today with ladysolly; we did 21 caches, all rather easy, and two DNFs. The weather was so warm, I was wearing my camo coat with no sweaters. Ladysolly solved a dozen puzzles. I'm rubbish at these, unless they involve something easy, like maths. Today, we went out to find the caches, but ladysolly hurt her ankle halfway round, so I had to do the last three solo. On the debit side, a bit of filling has dislodged, so it's me for the dentist again, ASAP. When I'm out all day doing a 20 mile circuit, it's really annoying if I get a puncture. So I do everything I can to avoid this. First of all, Kevlar reinforced tires. From Asda folding tires at £11.48 or the very fine Schwalbe Black Jack from Tesco for £12.42. I prefer the Schwalbe, but I carry a folding tire in the car, it takes a lot less space than the Schwalbe. Next, the inner tube. Normal inner tubes are very thin, but you can get thick-walled inner tubes that are much more puncture resistant. And they're cheap if you get them from JeJamesCycles here at only £1.75 each. Again, I carry a spare in the car. Between the tire and the inner tube, I like to put a gel liner, "Slime" brand or "Dr SLudge" or "Weldtite". Dr Sludge from Ebay, £10.99 for a pair. Make sure you get the correct width, then you cut it to length. The trick to installing it, is put on one side of the tire, then the inner tube, slightly inflated, then thread the gel tape between the tire and the tube. Then put on the other side of the tire, then inflate. 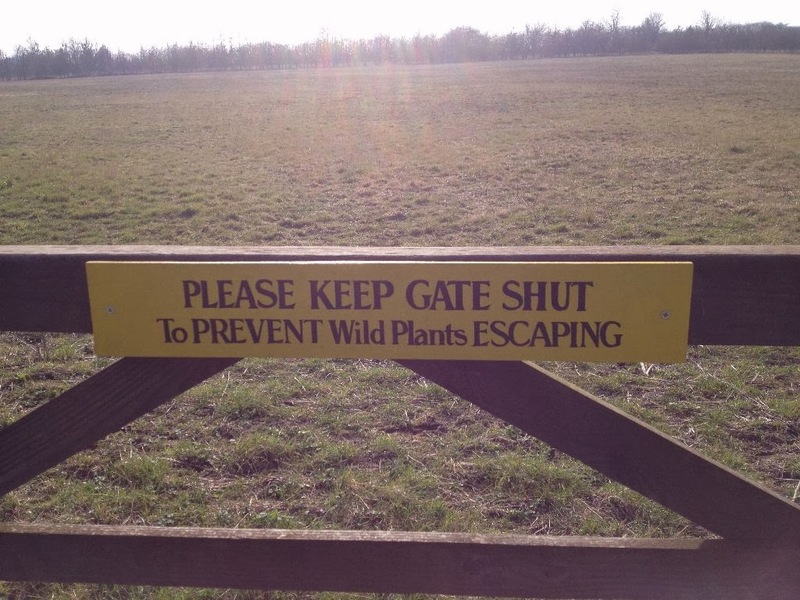 This has saved my bacon at least twice, apart from any thorn prevention. I've had tires worn so badly that they weren't just bald, they were completely worn through in one place and I could see the gel liner. But I was still able to get home, very carefully! You wind up with a wheel that's quite a bit heavier than with a light tube and no gel, and because all the weight is round the rim, a much higher angular inertia, but certainly for me it's worth the puncture resistance that this gives me. And I still carry a puncture repair kit, pump, spare inner tube and spanners. I'd quite like a display on my bike that shows me volts and amps as I ride along. Volts tells me how much I've depleted the battery; amps tells me how much power I'm pulling at any given moment. I already have volts; amps presents a problem. The problem is this. With the ordinary sort of ammeter, I'd need to run a six foot, rather thick cable from the battery to the handlebars, and back again, in order to transport up to 40 amps to the meter. That's not good. But there's a better way. I found a meter on Ebay that for the price of a pint, show volts and amps on one display; 0-100 volts and 0-100 amps. And I don't need the heavy cables. Here's how it works. To measure volts, only a very tiny current needs to travel, so I can use fine wires. To measure amps, I need a 0.75 milliohm resistor in series with the load (usually called a shunt). Then the meter measures the voltage drop across that shunt; that voltage drop is proportional to the current (using Ohm's law, V=IR), so it can calculate and display the current. So I ordered the meter, and a suitable shunt. I've had the meter for a week; the shunt hasn't arrived yet. But I realised yesterday that I needn't wait, I can make my own. Wire tables tell me that 10AWG wire has 0.9989 ohms per 1000 feet. That's very nearly 1 milliohm per foot. So my 0.75 milliohm shunt will be nine inches of 10 AWG. I got a short length of 10 AWG wire, and soldered it up. I connected up the meter, put my standard load of 10 light bulbs on, together with another ammeter, and switched on. I then needed to adjust the point of contact on the 10AWG wire so that the two meters read the same. Viola! The meter will go on the handlebars, and four wires will go to the back of the bike, That will connect to my switch/fuse/wattmeter assembly via a plug-in connector; it will also connect to a small battery that is needed to power the meter. I looked around my workshop for a suitable six feet of four wire cable, and decided to use a bit of ethernet cable. They have eight wires, so I have four spare wires I can use for something else; I'm thinking maybe the USB power connector for the PDA. All I need now is for my order of umpteen EC5 connectors from Hobbyking to turn up, and I can finalise the wiring. It all sounds so good, I've ordered two more of the meters, for the other bikes. At £3 each, it's hard to say no. First, I bagged a "Treasures of the Templars" cache, the last one that I haven't done, apart from the final. Then up to Covington, to do the Conga; 28 caches in a nice circuit, done on the bike on good tracks and with no difficult stiles. Back at Covington, I had lunch near the church, then went to get the final of "Treasures of the Templars". That took me to a place I'd visited before, because it was on the route of a circuit I did several months ago, and I guessed that the Templars cache would be here. But although SimplyPaul and I hunted for a long time, we didn't find it. But this time, helped by A) the certainty that it was there and B) the fact that someone else had found it since our DNF, I looked again. And after a few minutes, I found it! I've been doing this series for a couple of years now, it's nice to finalise it. Then on to Higham Ferrers and Stanwick, just buzzing around on the bike to pick up another 20 caches, for a day's total of 49, and a few DNFs. While I was out, the bike kept cutting out, but I'm pretty sure it's a loose connection, and I think I know which one it is, so I'll be replacing that connector with something a lot firmer. It works in a way I rather like; I change the MX records for the domain I want to protect so that MXguarddog receives the email. They then analyse it, and forward it on to my email address, suitably marked up with a SPAM flag. And to pay for it, all they want is a link to their site on my site, which I've done. Setting it up was pretty simple, especially if you're familiar with MX records, or if you use one of several services such as Godaddy. A busy weekend - on Saturday, down to London with ladysolly to see daughter.1 and grandson.1, who is a small ball of fun. We had lunch there and dinner, and, as usual, I ate too much. 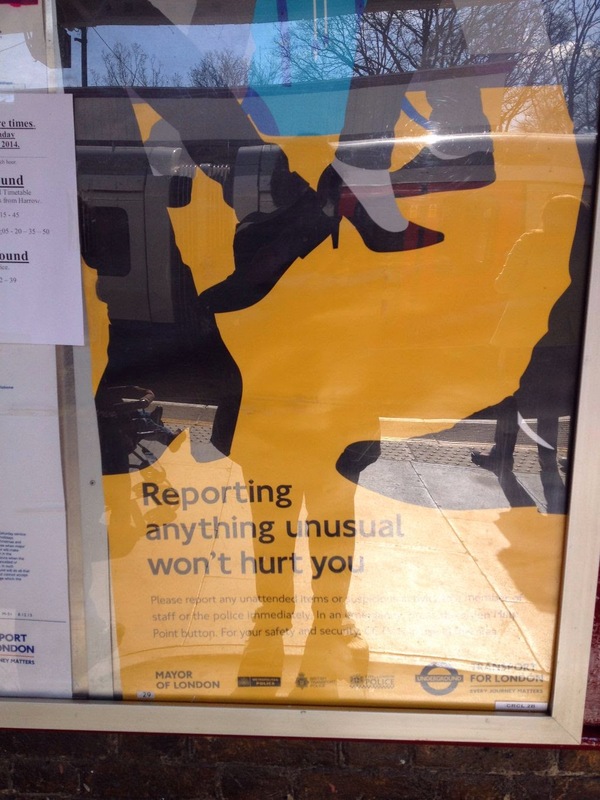 "Reporting anything unusual won't hurt you". What on earth does that mean? I see unusual things all the time - for example, that poster. Should I report it? 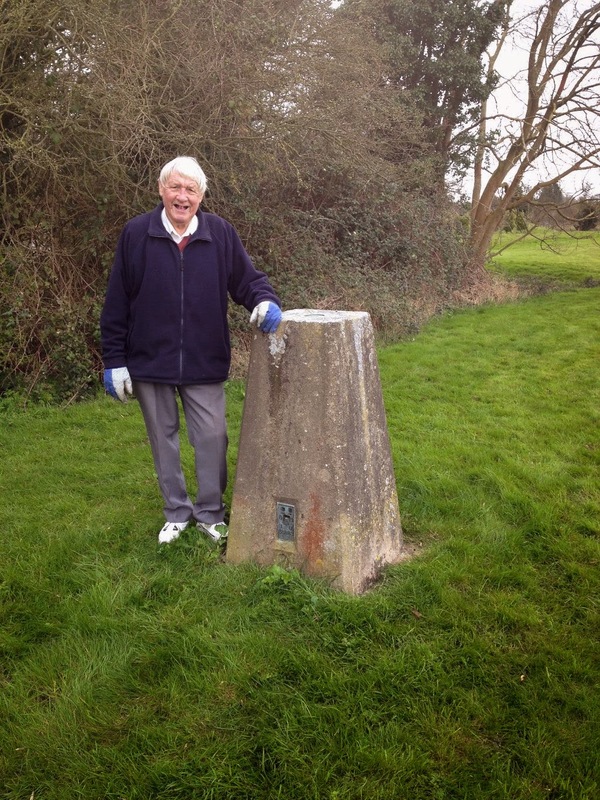 On Sunday out with ladysolly to do a dozen or so caches, all very local. 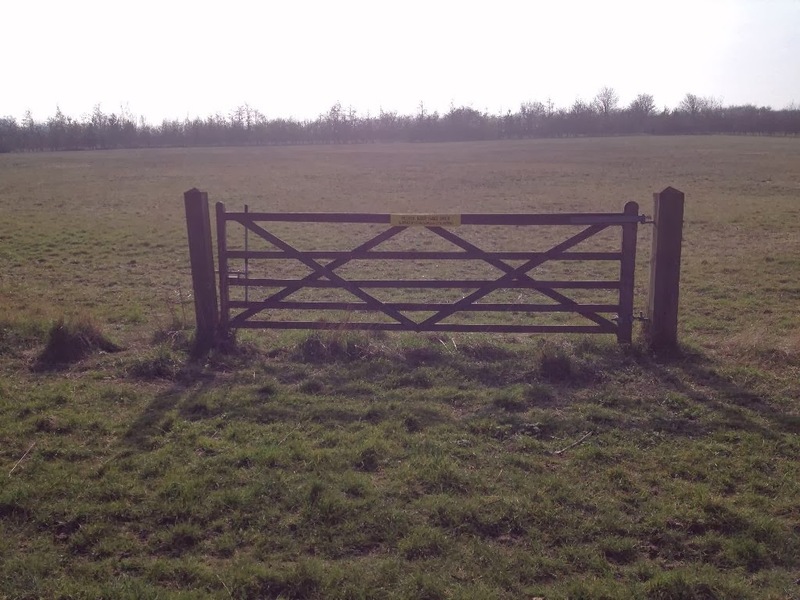 I went up to Letchworth today, to do a ring that goes all around the town, and which adds up to around 100 caches. I told ladysolly I might be late back (I was) because I intended doing the magic 100 in a day. So I loaded up all seven batteries (in the event, I only used four) on my two large saddlebags, two bottles of water, sandwiches, spare PDA, charger for PDA, spare driver cable, emergency repair kit ... and pedalled out of the car park. I had a problem immediately. 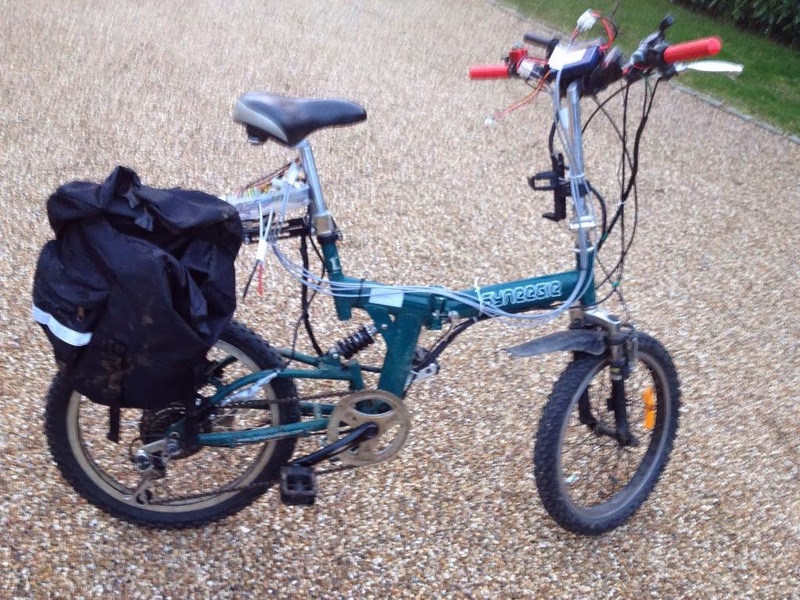 The bike motor wouldn't start from stationary, and would only start helping when I was going fairly quickly. So I did several caches with that handicap, and then it cut out altogether. I tried changing the driver cable, to no effect. So I stripped all the tape off the junction box, and poked and prodded - no luck. I decided that the sensible thing to do was to not attempt the other 90 caches, but to head back for the car and go home, so that I could fix this problem and try again tomorrow. On the way back to the car, the bike started working normally. I don't actually know what the problem was, but I suspect a loose connection. I'll investigate. So, with a working bike, I carried on. Round about 1 pm, I'd done about 40 caches, and there was a handy bench, so I stopped for lunch, and to strip off two layers of clothing, because it was getting quite warm. 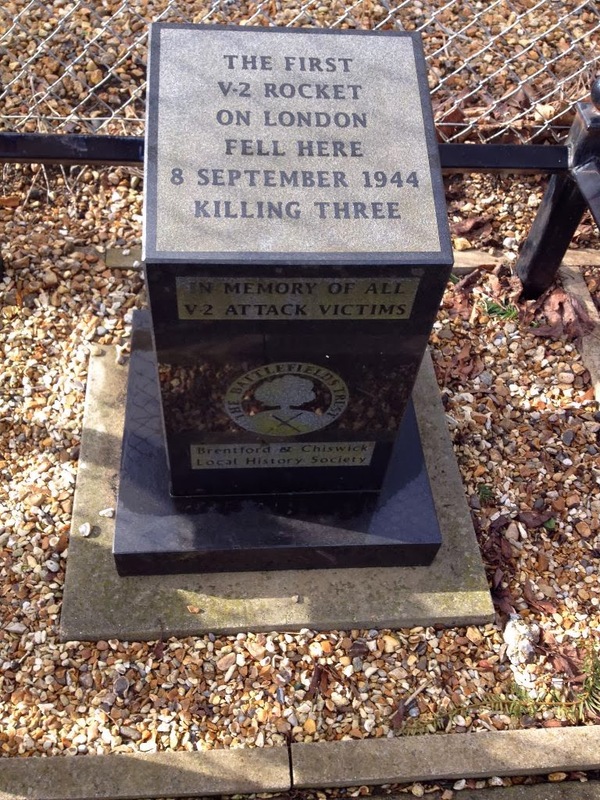 I continued round the loop, but I also did a few of the caches in Letchworth. While riding along the tarmac, I must have gone over a bump at one point, because one of my panniers jumped and came adrift from the back rack. The car behind me had to put his brakes on sharpish! I retreived the pannier and reattached it, but I'm going to have to modify that pannier so that this doesn't happen again. It needs stronger hooks. Around about 6:30, it started to get dark, but by then I'd done about 85 caches, and I continued on using a head torch. I've also got a nifty rear light, which I put on when I'm on a tarmac road, so that people driving cars can see me. I also have a rear red light on the head torch, and the bike has headlights, so if any car driver fails to see me, they must be blind. I made a mistake with one of my batteries. I connected it to the bike for power, but I connected the battery monitor to a different battery set, which meant that those batteries weren't being monitored. As a result, I ran them down to 3.0 volts, which shouldn't be a problem (although my usual low level is 3.2). But I'm having problems charging them now. Maybe I can sort it out, but if I can't, replacing that battery pack will only be about £32. I need to set somethnig up so that doesn't happen in future. I got back to the car at around 7:30 pm, but I wasn't finished yet - I wanted to get a couple of puzzle caches that I'd solved a long time ago but hadn't yet picked up. Then I got back to the car again, had my coffee and bun, and set off for home. An excellent day out, 104 caches done. And I'm knackered. The Infineon is the bike controller I got for bike.3 and bike.4. In bike.3, it works well, but because it's sensorless, it's not so good at acceleration from stationary. I think that would be a problem with any controller - the answer is, don't use sensorless motors. In bike.4, it performs like a dream. It feels like flying. So I bought two more controllers, a 6 fet 3077 and a 12 fet 3077. My plan is to put the 6 fet into bike.4, which will free up the 12fet one there now. And then I'll test it, because the 6 fet is only rated at 25 amps, and although I've been told that it should be good up to 60, I want it to be able to run at 40 amps, and I want to test to see that it really will. The next bike I plan to mod will be bike.2. That's the Haro folder. It works fine, but when I replace the controller, it'll work even better! That should be a pretty easy mod. Then when that's complete, I intend to tackle the Forza, which will, when finished, become bike.5, The Forza was my first e-bike. It's quite heavy, and doesn't fold. But because it's so solid, it'll be good for trips to places where I can be sure I won't need to do any lifting. I tried to sell it on Ebay a couple of months ago, but I only got offered £150 for it, and it's worth a lot more than that as spare parts. I mean, the motor wheel alone is worth £150. It uses 36 volts, but I plan to run it at 48 volts nominal (meaning 57.6 volts when fully charged). I need to strip out the old controller and associated parts, and put in the new one, which will probably be a 12 fet so that I can run 40 amps. I can use my existing batteries, chargers, etc, so the only cost to this conversion will be the controller ($92) and a throttle/switch ($16). As well as the controllers, I bought three throttle/switch assemblies, and three torque arms. The Cycle Analyst is a comprehensive instrument for electric bikers. It tells you everything you might ever want to know about what's going on, and also helps you control things. I was trying to decide whether to get version 3 or version 2.3, at a cost of $125 vs $155. Although I wanted a temperature readout, I knew that wouldn't work for me because my motor doesn't have a sensor - likewise many of the other features wouldn't be useful to me. So then I concentrated of version 2.3, looking at the features there, when suddenly, I realised that maybe I didn't want a Cycle Analyst at all. So what do I actually want? I'd like to know the voltage of the battery, the amp-hours used and the speed I'm moving at. But I already have those, via various things already installed. It would also be nice to know the current being pulled at any time, and that's the big piece of information that I was missing. 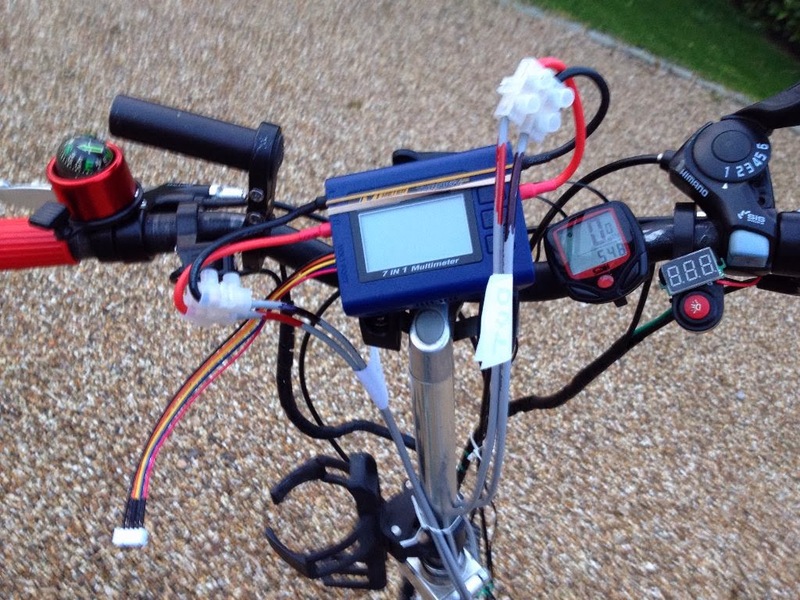 When I was testing bike.4, I temporarily installed an ammeter by running four big cables between the battery and the handlebars. 4 mm sq so that they could carry the big current (42 amps) without putting a lot of resistance in the circuit. But I didn't feel that this was really practical. So I went to Ebay and had a look at ammeters that can go up to 100 amps. And there's loads of them, all really cheap, but with the disadvantage that you have put add an exterior shunt. Hang on. That's not a disadvantage. That's a big plus! I can put that big shunt down at the battery end of the bike, then I need only a couple of small wires, capable of carrying up to 4 amps (10 if I want to go up to 100 amps) up to the handlebars. So, here's the Poor Man's Cycle Analyst, giving you a handlebar readong of volts, amps and speed, and when you stop and have a look at the battery end, you can see amp-hours and watt-hours, and peak current usage. It starts off with one of these. £8.89 and that give you amp-hours, watt-hours and peak amps. Plus some other stuff that isn't so useful. That installs at the battery end, and will handle 50 amps (100 amps peak) at 60V. That's plenty enough for me. When my battery is exhausted, and I dismount to change battery, that tells me how many amp-hours that battery gave me. I expect 4.5 (these are 5 Ah batteries). If it's a lot less, then that battery has a problem, and I'll need to replace it. I want to have a voltage display on the handlebars, because that gives me a good idea of how much power is left in the battery I'm using. £1.83 gets me a voltmeter that goes up to 120 volts, and uses only two wires (the three-wire voltmeters need a separate power supply, slightly less convenient). I want a speedometer/odometer, to tell me my speed and how far I've biked. £2.08. So the total is £18.83; the Cycle Analyst is £76. Of course, the Cycle Analystdoes a lot more, and you need to read the description to decide if you want the additional features. But I don't think I do. 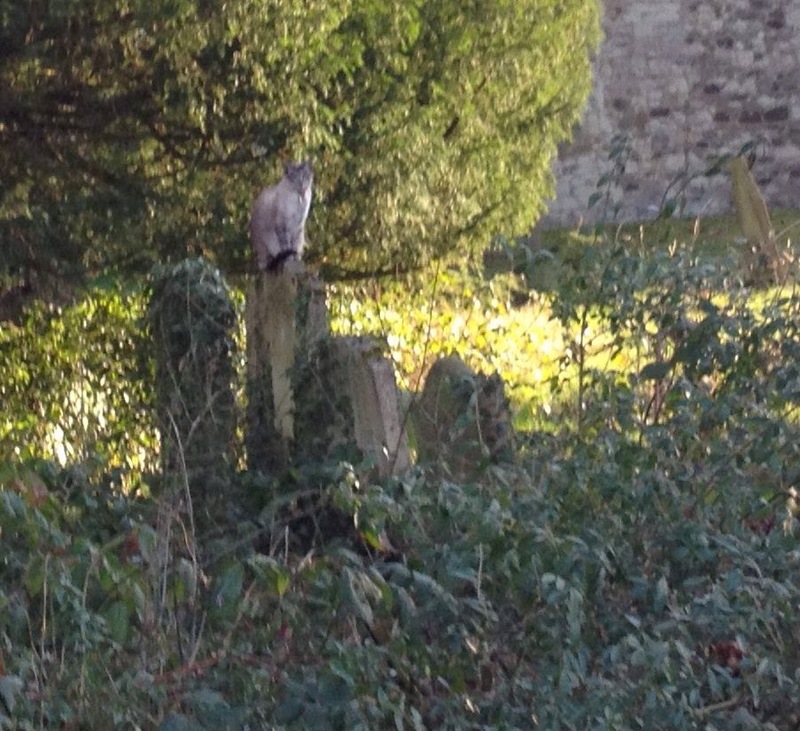 A cat sitting on a gravestone, looking like a statue of a cat. The trip to London was excellent. I started off at Chiswick Park, doing about 10 caches, incluging the first V", which goes nicely with the first V1 that I did last week. 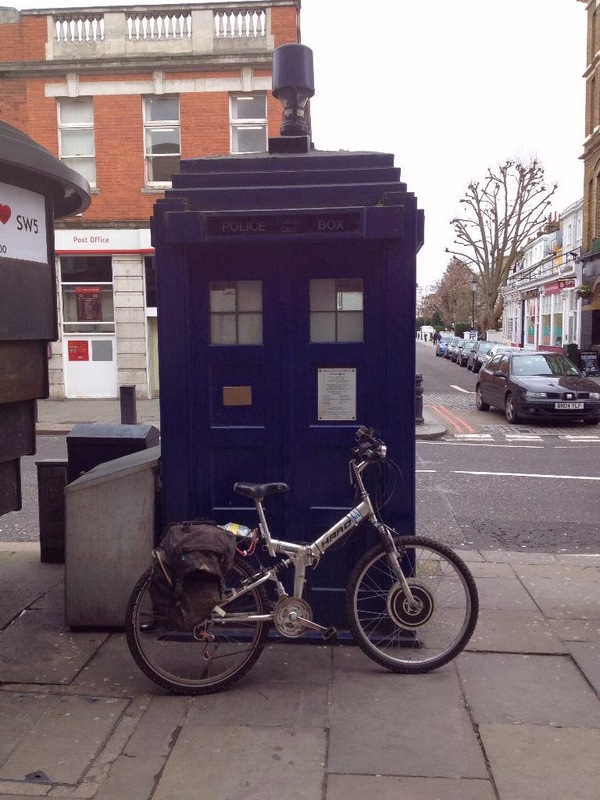 I also saw the Tardis; that's my bike casuallly leaning on it. Then I visited the Russian Greek Orthodox Church, then I biked east to pick up several more on the way. I stopped at 12:00 to phone daughter.2, who had offered to take me to a salt beef bar, but I was cruelly diappointed when she offered me pizza. Onwards to Hyde park; picking up the one I DNFed a few days ago in Belgrave square (I repkaced it), and then to finally, at last, eventually, finishing "Alien Invasion". Yay! And while I was in Hyde Park, I did "On your bike", since I was on my bike. Then on to the BBC, where I spent ages pacing up and down to do "The World" while watched by a bored security guard. And then just as it started to rain, I biked back to the car. I used 4 1/2 of my 7 batteries and found 33 caches. While I was doing something to my bike, three ladies walked past, and I heard a bit of their conversation. "I had this thing popped up on my computer, offering to upgrade my sky box, so I clicked on OK, and now I can't" and that was all I heard. Another snippet heard while in Hyde Park "he's got a very addictive personality." "Oh, is he back on the cocaine?" I didn't hear how that one came out either. I have a 20 inch wheel folding bike that I haven't used for a long time. Instead, I've been using the 26 inch wheel bikes, based on a Haro folder. The Synergie (which I plan to name bike.4) had two problems. The first problem was that the pedals got very wobbly. I decided that this was caused by worn bearings in the bottom bracket, and my local bike shop said the wouldn't be able to fix it, because it used a custom bottom bracket. I believed them, but after several months, I was looking in Ebay for a bottom bracket for one of the Haros, also because of wear. And I found that bottom brackets come in all sizes, and are quite cheap, about £9. So I bought one that I thought would fit bike.4, and blow me, it worked a treat. So, first problem fixed. The second problem was more severe. I couldn't see any way to put a rear carrier on the bike, so carrying spare batteries, water etc was a major problem. I could only use a backpack, and that can be a lot of weight on my back. But very recently, I looked at bike.3, which doesn't have eyelets for a carrier, and reaslised that the carrier that I had on that, would very likely work on bike.4. So I got one from Ebay, £15, and yesterday I fitted it, and it looks good! This means that I can remove the rear battery carrier shelf (the battery will go in a pannier), and while I'm about it, I can replace the bike motor controller with something a lot better - an Infineon. So I removed the battery carrier, and unwound the curly-wurly cable tidy, took off the cables, and looked at what I had. The first thing I saw was the reason why the front light wasn't working - the wire had broken. I also found that the microswitch on one of the brakes (it's to cut the motor when you brake, in case you forgot to) wasn't working. So, I stripped off all the wiring, put on a new pair of brakes with working switches, put on the three-way switch that will change power levels from 50%-75%-100%, repurposed the light switch as an ignition cutoff switch, put on a thumb throttle to replace the twist throttle (I've gotten used to a thumb throttle now, and a twist throttle would confuse me), programmed the Infineon controller to match the bike, and got everything wired up. The light switch didn't work, so I took it to bits and had a look. The problem was the wire, so I unsoldered that, and looked around for a suitable wire - I wanted something thin and light (this isn't carrying many milliamps of current). I chose a cable I've had for ages, it came with a UPS, and I don't link UPSes to my computers (you can tell the computer to shut itself down when the UPS signals that power is out). It looked like a serial cable, but it didn't behave like one. So it's been sitting in a box for many years. I cut it open, and to my delight I found four multi-strand wires inside. So two of them will go to the light switch (now my power-on and power-off switch, like the ignition switch on a car) and the other two will go to my voltmeter. So I attached the voltmeter to the ignition switch, and it looks very neat. All the electric bikes I've seen use a blog system. Five blobs means full, and it stays at five for a long time, then rapidly moves down to 4, 3, 2 at which point, you're empty. Not very useful. Another system is even worse, you get green-amber-red. Again, it stays on green for ages, then you get amber for a very short time, then red. So you have really no idea how much battery you have with either of those. But the voltmeter (which cost about £1, plobably less than the blobmeter) tells you exactly how many volts you've got, to one decimal place, which is exactly what I want. So now I was ready to roll. I put the bike on a bike stand, hooked up one of my old batteries (they have a 10 amp fuse, which I like the thought of in case of catastrophe), Ignition on, apply throttle ... nothing. I tested the Halls - OK. I tested the motor windings - OK. I reprogrammed the controller to be happy at only 25 volts, tried it again ... nothing. I tried my Hobbyking Lipo batteries, nothing. I removed the brake cutouts, in case one of them was stuck on ... nothing. I unplugged the three-way level switch ... nothing. I won't go down the list of all the things I tried; I'll cut to the finish. I had the throttle wired backwards. Duh. That's because I couldn't use a proper socket for putting the throttle plug into - I've ordered a bunch of suitable 6, 3 and 2-way plugs and sockets for this sort of thing so I shouldn't have this problem in future. So the motor turned the wheel. But switching beteween level 1, 2 and 3 did nothing. Again, the cause turned out to be stupidity; in my thrashing around to fix the "it doesn't work" problem, I'd disconnected the three-way switch. As soon as I reconnected that, the motor turned, it responded nicely to the throttle, and the three levels worked - 50%, 75% and 100%. By that time is was 11:30 pm, too late in the day to take the bike out for a spin. Plus, that bike doesn't have a speedometer (I've ordered one, £3, I cannot believe how cheap all this stuff is). And I need to go round the bike tightening up all the things I loosened, I need to make it so that the wiring doesn't just hang down to the ground (cable ties are my friends) and I need to balance the rear wheel (I've noticed some of the spokes aren't taut, and the wheel isn't running true). But this is all straightforward stuff. At this point, I know that this bike is going to work! And I weighed it. It's 13 pounds lighter than bike.1 (44 pounds compared to 57) and that can be a big blessing when you're lifting a bike over a five bar gate that should have been left unlocked but which has been chained and bolted. For example. Tomorrow, I go to London again. I'll be going in from the West (my two previous forays came from the North and then the East. And I'm hoping to finally finish off London Invasion.